One dominant story line coming out of the Seahawks loss to the Cardinals on Sunday was that Russell Wilson’s receivers let him down. There have been numerous unchecked comments on Twitter and on sports radio stating that Seahawks receivers dropped passes. It is time to check those assertions. Judging receiver play goes well beyond catching the ball. It is important to understand the route called for on the given play, the style of defense the defender is playing (e.g., are they playing outside leverage or inside? ), as well as the timing of when they are supposed to reach their spot on the field. None of that will be examined here. The predominant claim is that receivers dropped balls they should have caught. Wilson had 16 incompletions on Sunday, and 18 completions. I went back and watched every pass from multiple angles. There were 13 plays worth sharing here, five were completions and eight were incomplete. The incompletions that were not included were left out because they were clearly not dropped passes (e.g., the ball is 10 yards out of bounds, the defensive back batted the ball down). Feel free to point out any you believe I missed after reading. The completions I left out were because they were well thrown balls that hit the receiver in stride, and required nothing extraordinary from the receiver to make the play. 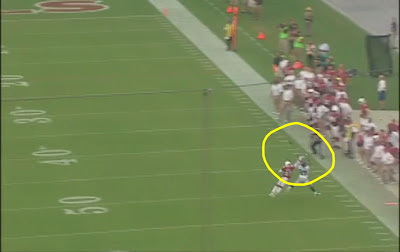 This was Wilson’s first career pass. It was well behind Marshawn Lynch, and was tipped into the air. Rice alertly made a diving catch. 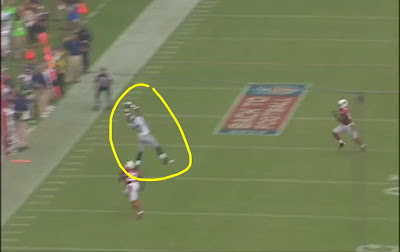 Nice play by the receiver. Wilson tries to lead Rice away from the defender toward the sideline. Rice makes a valiant effort by diving for the ball and gets a hand on it. 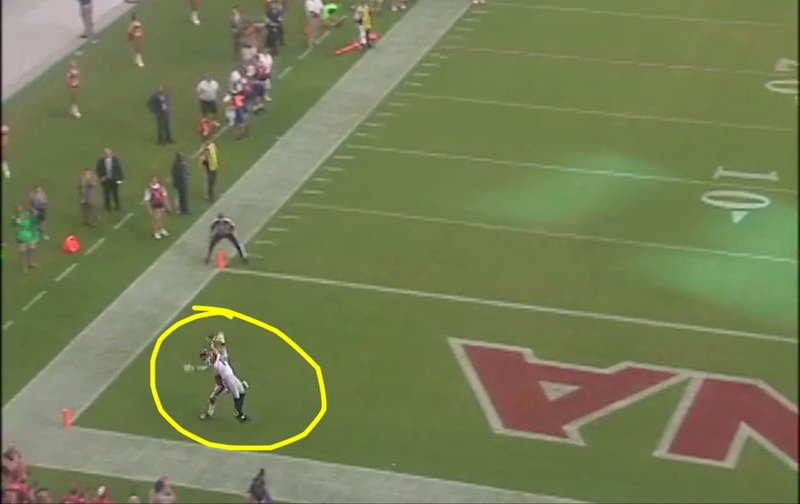 It would have been a special catch, but most players would not have even touched the ball. 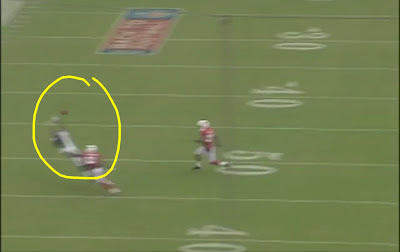 Once again, Rice makes a strong effort to haul in a pass out in front of him, requiring a dive to haul it in. Not a fantastic catch, but certainly a good one. Wilson makes a nice throw, but Baldwin is well-covered and the defender gets his hands between Baldwin’s to knock the ball away. An argument could me made that Baldwin could have made a better play on the ball, but it was definitely not a drop. 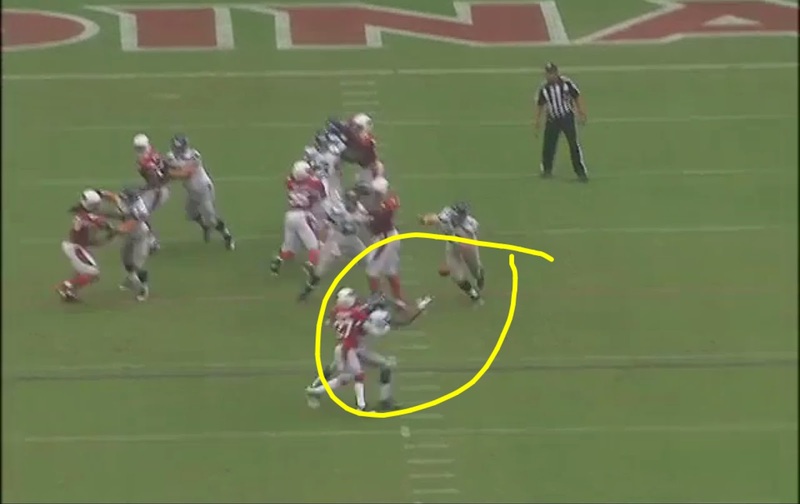 Wilson expertly went through multiple reads here. 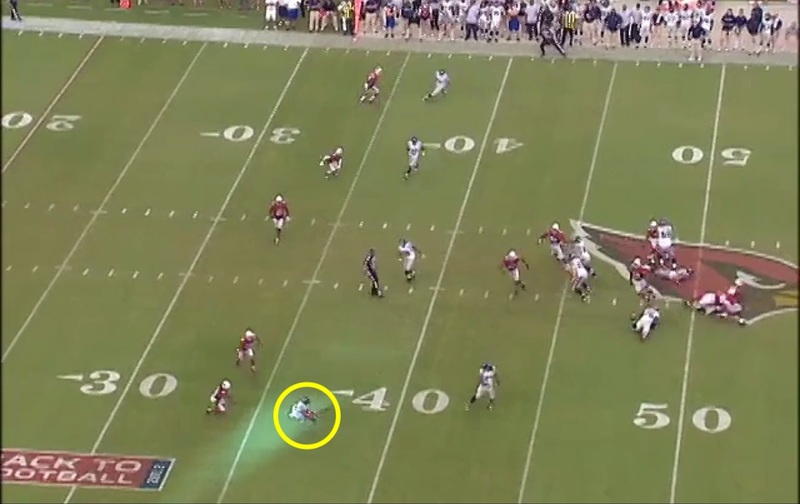 He thought he saw something in coverage pre-snap, and hurried the team to the line. 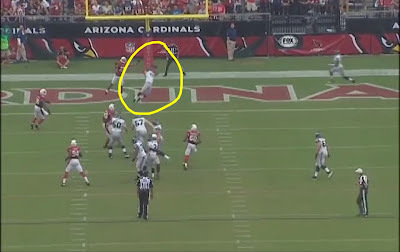 The Cardinals either adjusted, or Wilson misread it pre-snap, because his first read was not open. He found Rice and threw a decent ball under some duress. Rice makes a leaping catch while running across the field. It was not a spectacular catch, but it was a good one. He helped his quarterback out on this one, as many receivers do not have Rice’s catch radius. 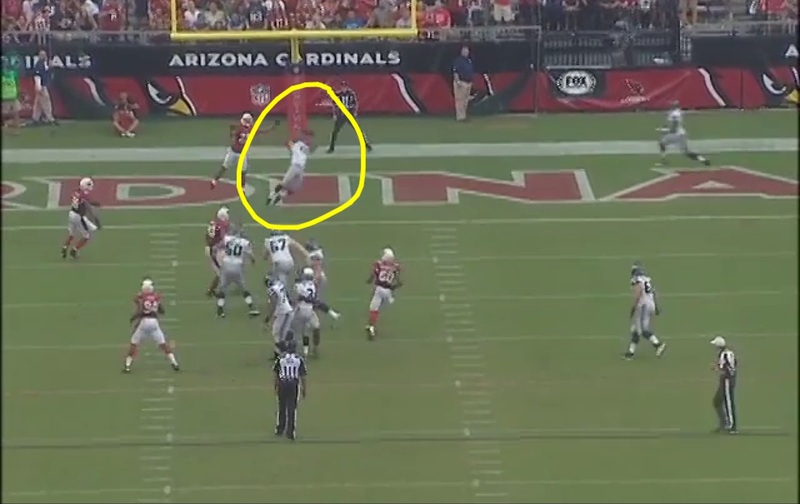 Wilson threw another high ball, but Edwards went up to get it. The defender was draped on his back, and he was unable to come down with it. Note, in this image above that Wilson is throwing from the bottom of the frame to the top. The ball is sailing high and outside to Edwards, not coming down to him. Very hard to consider this a drop. Wilson makes another high throw, but Edwards leaps and comes down with it. Nice catch. Not heroic, but not routine. 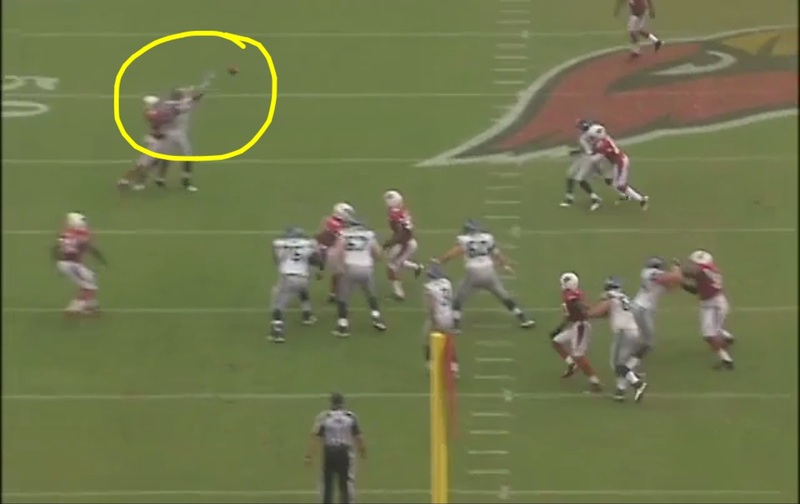 Wilson’s throw is high and wide. Rice goes full stretch to try and bring it in. The ball grazes his fingertips. 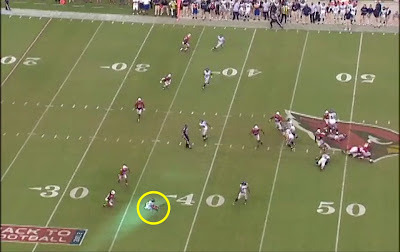 You may remember this play is when Rice pounded the turf because he thought he should have come down with the ball. Take a look for yourself. This was not a ball anyone should be expected to catch, and certainly not a drop. Another high pass from Wilson. 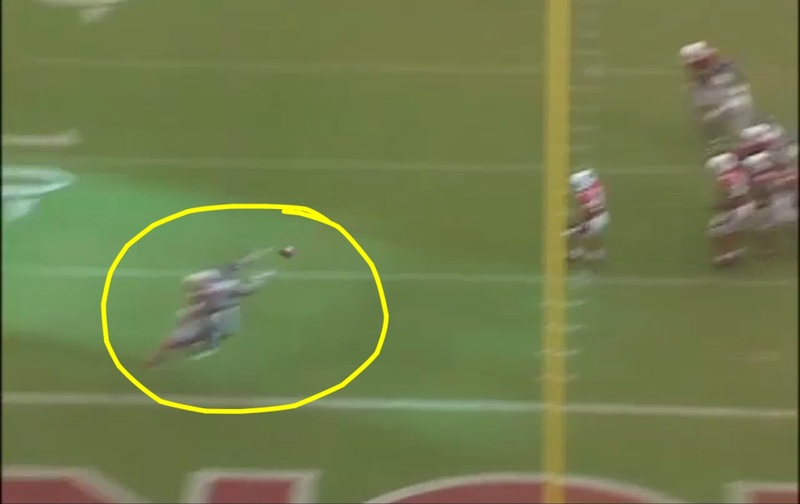 Edwards makes a leaping attempt, and comes down with the ball. Nice catch. Wilson had heavy pressure and had to get rid of the ball faster than he wanted. 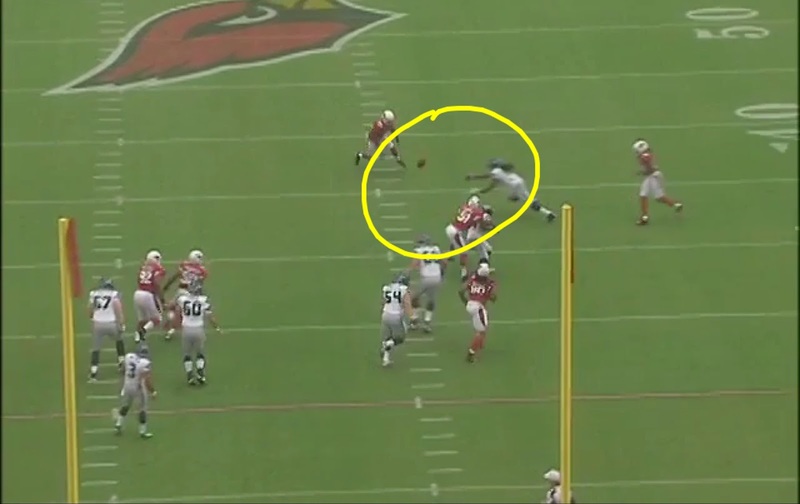 Baldwin was running inside, and the ball was thrown behind him. Baldwin stopped and tried to dive backwards, but could not make the catch. 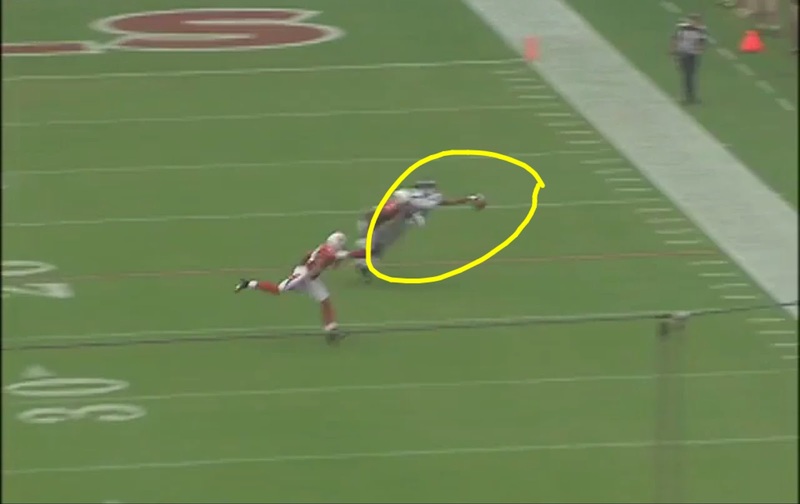 This is a catch Baldwin should make, although, it was far from an egregious error. 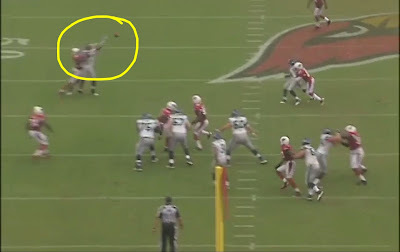 It would have bailed out his quarterback (and offensive line) for what was a bad pass. 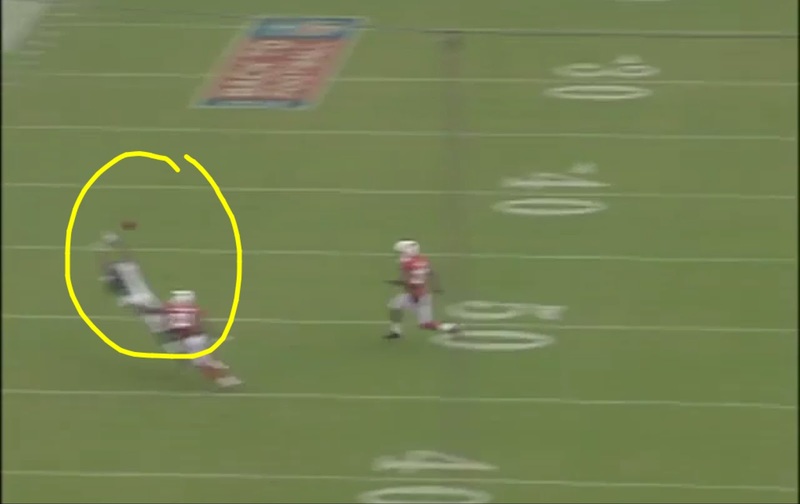 Wilson makes the right read, but throws wide and with extra zip, making the catch far harder than it needed to be. Baldwin goes full extension and nearly makes a highlight reel catch, but ends up losing the ball, and a few teeth, as he hits the ground. Wilson’s pass was late and lofted too much. It almost seemed like an overcompensation for the previous underthrown ball to Rice. Martin still makes a great effort, but cannot come down with it. He had to turn around in order to have a shot. This would have been a terrific grab. Wilson threw this pass so hard that I had to replay it five or six times before I could freeze a frame near the catching opportunity. He made a good read, and the accuracy was acceptable, but the touch was that of a player who felt too amped or nervous to make the throw with proper touch. This is the play that everyone is saying Edwards has to make. Forget that he was clearly interfered with. The pass was high and hot. This was not a gimme that should be caught every time. 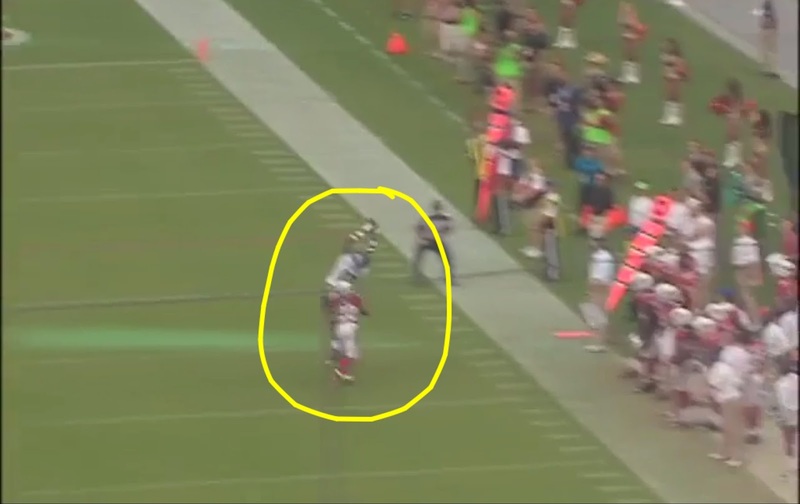 He should have brought his hands up sooner, but this guy made multiple catches during the game (shown above) that prove he can make these plays if given a reasonable chance. 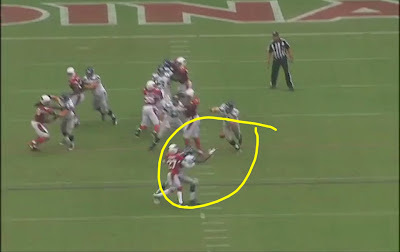 Call it a drop if you like, but this is not a play I would hammer a receiver on. Those were 13 plays, eight of which were incomplete passes. None of them appeared to be drops, and the ones that are debatable, are just that…debatable. This receiving corps does not deserve the piling on that has happened since the game for dropped passes. Not only did they not drop passes, but they made some special plays, including the touchdown. None of this is to say Wilson was at fault. Please remember that only five of his EIGHTEEN completions were shown. That means 13 of his completions were well thrown balls. This is not meant to paint the picture that every completion was because of the receiver, or that every incompletion was because of the quarterback. It simply is meant to help people form a more educated opinion about the question of whether receiver drops were a big problem on Sunday. The evidence clearly does not support such a claim.